First Line:"This is all I know about my real mother." 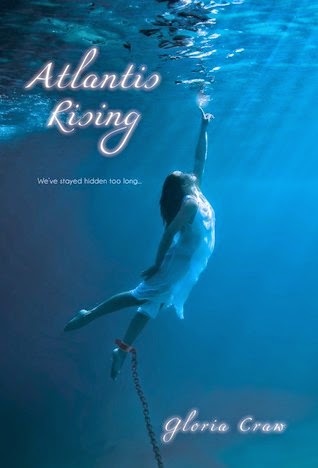 Review: Okay right off the bat for some reason I really thought this book would have something to do with underwater creatures like Mermaids or maybe something else but it wasn't which was a surprise in a good way, the book had to do with a non-human race called Dewings the people of Atlantis. Alison was a likable character. She knew she was different but nothing else. She has been thrown around in the foster system for most of her life with no clue on who her real parents are or why she is the way she is. She was once approached by a stranger warning her to stay below the radar and that someone was after her who wanted to use her special powers and because of that warning she became very reclusive, making sure to dress in a way that wouldn't draw any attention to her and just remaining friendless. I found Alison to be brave especially with everything thrown at her and I admired how she really cared about the people around her and was willing to do whatever it took to protect them. As for the secondary characters I would have preferred them all to be a little more developed. I liked Ian the love interest, but same thing with him I wanted to dive a little deeper into who he was. Speaking of Ian the romance was there but it just kind of hung around in the background with little swoon moments here and there. This is actually one of those novels where I would love to see a second book to see how things progress with the two. Alright now the evil guys. I think this is what made me drop my rating a little bit. To me the bad guys were just that bad...evil. I like my villains to be more complex with several layers to where even I hate them and feel some kind of emotion towards them. Then there was the ending in regards to the final face off between the good vs bad, it all just happened rather quickly and I found it to be a little anticlimactic. Overall Atlantis Rising was an enjoyable read, even with the few issues I had there is so much more I want to know about the world since I felt there was a lot of unanswered questions when it comes to the people of Atlantis that I'm hoping there will be a second book.